Congress president Rahul Gandhi is addressing the media on the issue of Rafale fighter jet deal, a CAG report on which is likely to be tabled in Parliament on Tuesday. The Comptroller and Auditor General (CAG) of India report on Rafale deal was sent to President Ram Nath Kovind on Monday evening. The Rafale fighter jet deal has led to a massive political controversy in the country ahead of the Lok Sabha elections, with Rahul Gandhi alleging massive corruption in the inter-governmental agreement inked between India and France. “Narendra Modi ji is acting as the middleman of Anil Ambani. This email is clear. An Airbus executive wrote that Mr Anil Ambani met the French Defence Minister and told him 10 days before the Rafale deal was signed that he was going to get it”, says Rahul Gandhi. 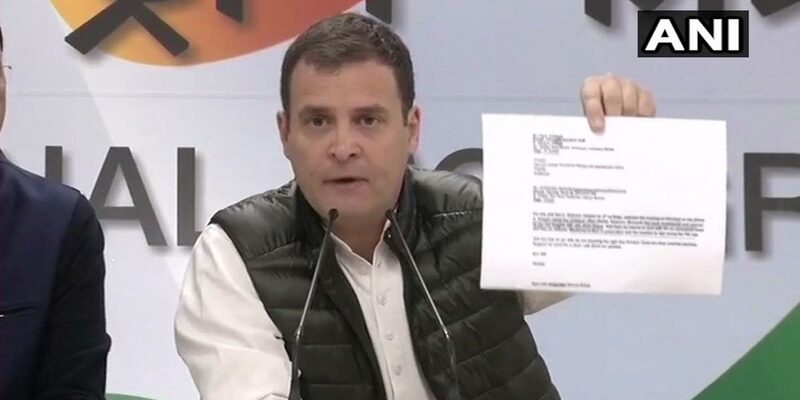 Rahul said referring to an email that Anil Ambani had met French Defence Minister Jean-Yves Le Drian in France some 10 days before the announcement of the Rafale fighter jet deal. Rahul’s allegations came after The Indian Express newspaper reported on Tuesday that Ambani had met Le Drian at his office in Paris and also had a meeting with his top advisors.